The shopfront of this northern-end Lygon St diner is all spattered paint and bright neon. It's relatively new, probably 12-18 months old. I'd picked up a menu early on, and had on a couple of occasions when walking past encountered someone out the front proferring small sample cups of curry. As a small, local business, I hoped things were going well, but from the amount of traffic I witnessed going in and out I had my doubts. But then lo, someone from the all-knowing supplement that is Epicure paid them a visit, and wrote up one of their dishes for the Under $10 column. The dish in question was a goat curry, and coming in a full $4 under the column's maximum, it sounded like too good an opportunity to miss. I was suitably impressed when I first tried it for myself many moons ago. Travelling home this week with a dismantled bike on the back seat, its back tyre as deflated as its rider was when he heard it go 'pop', some cheap, impromptu curry sounded like a good way to rescue the evening, so India on Lygon finally got its repeat visit. Prices are up; but at $8 or so for most curries they're still at a suitable price for Epicure's column. 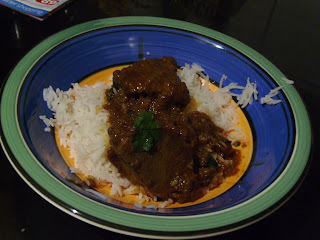 Goat is available as either masala or biryani and, as before, I went for the former. If it all looks a bit indistinct in the bowl, it's not just due to the quality of photography! The goat meat comes on the bone: big slabs of it, with plenty of sinew to tear through to get the meat free. Don't bother with a knife and fork. Go traditional and get your hands and teeth in there! I like to imagine when I'm eating this dish that I'm in a tent in the mountains and in the distance I can hear bells from a herd of goats that, in order to meet our appetites, is now one less in number. On my first try the only obstacle to such a fantasy was the undeniable fact that I was actually in a flat in Brunswick East, and while there may have been bells, they were of the bicycle, not bovid, variety. This time, however, the meat let the dish down. I know it's not meant to be the tenderest of varieties, but it was too tough. It was saved, however, by the sauce, which was enjoyably spicy. 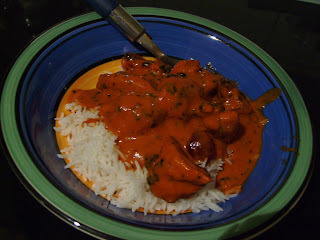 The butter chicken turned out to be a better option. When done poorly, this dish is just foul - just a bowl of oil and cream with some white meat floating in it. India on Lygon's version is a lot more subtle however, and they've taken care to make sure the spice dominates rather than the liquid ingredients. We really enjoyed the garlic naan first time around as well. It was a bit singed on this occasion, unfortunately. It still held its consistency, however, to do a fine job of mopping up sauce. And given two curries, rice and two naan cost just over $20, I think we got about what we paid for. 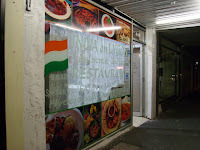 Update: India on Lygon underwent a change of management a few months ago. It's still the same look outside, but the decor inside has been schmicked up a little bit. I can't report as yet whether there are marked changes to the food. For vegetarians the flavour is great and cost even less. The Malai kofta is up there with the best i've had, and the kashmiri rice a flavoursome adventure. Great value. Good point - there's no doubt their sauces are excellent, and it's really asking a bit much to expect the meat to be wonderful for the price, so vegie would be the way to go. Yeap... there food is amazing.. i am there regular customer..and day by day they are getting more customers. why to pay $15+ for a curry, where u can get alot better at cheaper price.